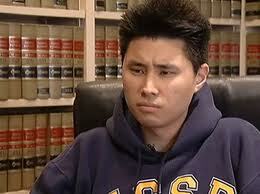 Daniel Chong was left by DEA in cell for 5 days without food or water. A San Diego college student who federal drug agents forgot and left in a holding cell for five days without food, water or access to a toilet said Tuesday that he drank his own urine to survive. Daniel Chong also said that he bit into his glasses to break them and tried to use a shard to scratch “Sorry Mom” into his arm, according to U-T San Diego. The 24-year-old University of California, San Diego, engineering student was swept up as one of nine suspects in an April 21 drug raid that netted 18,000 ecstasy pills, other drugs and weapons. Chong said federal Drug Enforcement Administration agents told him he would be let go. One agent even promised to drive him home from the DEA field office in Kearny Mesa, he said. Instead, he was returned to a holding cell to await release. DEA spokeswoman Amy Roderick said he was accidentally left there. Chong said he could hear the muffled voices of agents outside his five-by-10-foot windowless cell and the door of the next cell being opened and closed. He kicked and screamed as loud as he could, but apparently, his cries for help went unheard. When he was found on April 25, he was taken to a hospital and treated for cramps, dehydration and a perforated lung — the result of ingesting the broken glass. Chong also ingested a white powder DEA agents said was left in the cell accidentally and later identified as methamphetamine. The agency hasn’t commented on Chong’s claim that he was without basic necessities for days. Chong’s attorney, Eugene Iredale, said he plans to file a claim against the federal government, and if it is denied he will proceed with filing a federal lawsuit. This is a major scandal, without coverage. I scanned Google’s news cache to see if this story got anywhere nationally and found the the first 30 or so organizations and sites carrying it were, with two exceptions, minor, narrow interests and basically unknown. The two exceptions, CBS and MSNBC, both have local affiliates, and so could simply pick up the tapes and replay them. Oh… the UT had a story yesterday, short and unquestioning. Congratulations are due NBC/39 for staying on the case and doing what the DEA doesn’t want, the shine of light on another display of weird police behavior. Read the comments form the UT artical. One of the posters, Rex Smith goes on to say it was an honest mistake and seems more concerned that the people responsible won’t lose their jobs (they won’t). Sad world we live in. This is your country on NDAA. Get used to it, suckers. It’s a shame … there will be fall out. This was no accident. Speaking as someone who has been in a holding cell I can assure you that unless you are in a basement somewhere NOISE GETS OUT AND NOISE GETS IN. I would think it more likely that either a shift-change exacerbated the situation or they were trying to “turn” him and reveal more info about his friends; some of whom may have gotten away. Either way it is beyond cruel and unusual. SOMEONE SHOULD LOSE THEIR JOB. SUSPENSIONS are for HIGH SCHOOL! Sadly, no one will lose their jobs. This article has taken off. There’s lots of interest. Right now, 8pm Wed May 2nd, there are over 770 hits on the post.